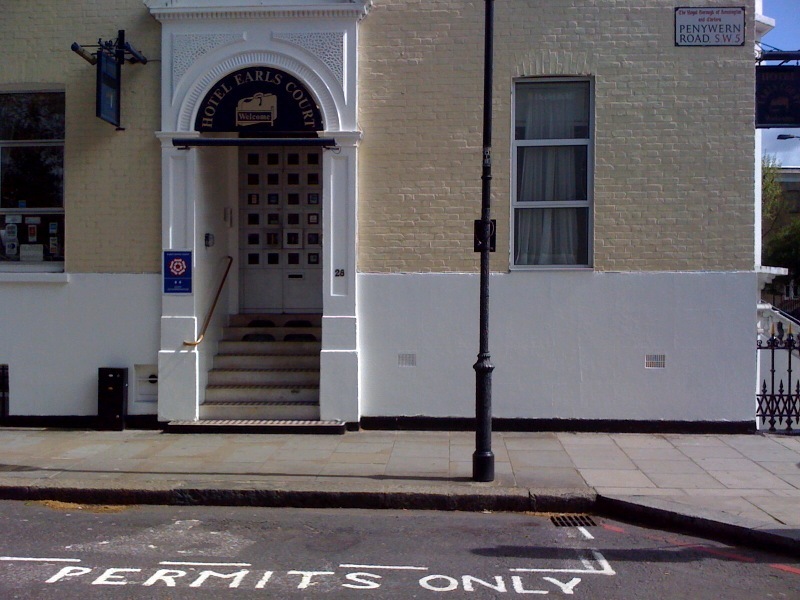 A few months ago, we published a post about the ludicrous motorcycle parking arrangements in the Royal Borough of Kensington & Chelsea (RBKC). 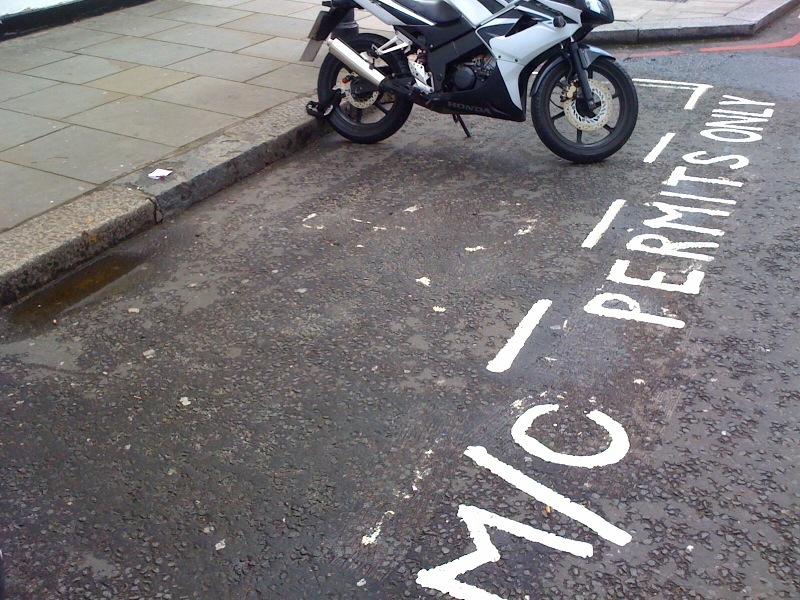 Basically, if you’re a visitor to the RBKC, it is almost impossible to find a space to park your motorcycle. This is because residents refuse to purchase a parking permit to park their bike in one of the 960 spaces dedicated to them which, theoratically, should be all equipped with locking ground anchors. Residents prefer to use the 1,218 spaces provided to visitors, which are all free of charge, although they don’t have security devices. We don’t blame these residents, as it is perfectly understandable that they don’t want to pay to use bays equipped with rubbish security devices, which get wet, floaded and dirty under the rain, when they are given the opportunity to park nearby free of charge. Anyway, while walking in the streets of Kensington & Chelsea a couple of days ago, we spotted the presence of a motorcycle parking bay for residents use only in Penywern Road, London SW5, at the corner with Warwick Road, which had no security devices, although the council’s website specifically states that “all permit-only designated motorcycle bays are now provided with locking ground anchors”. Well, that’s obviously not true, is it? The council charges residents a minimum of £35 to use these bays, which are all supposed to be equipped with locking ground anchors. Where are the locking ground anchors? Perhaps the RBKC thinks that motorcyclists are a bunch of idiots who can be bullied and treated like cash cows? If the RBKC continues with their racket, we won’t be at all surprised if sooner rather than later, the No To Bike Parking Tax campaign comes their way and causes mayhem in Kensington & Chelsea, as it is the case every Wednesday morning in Westminster. Be careful Kensington & Chelsea, the bikers are keeping a very close eye on you! I noticed that about 90% of their rubbish security devices are not being used in the bike permit bays long ago ! I guess the RBKC is now dropping the idea of putting any new security on the bays and just charging money for nothing just like Westminster city council is doing too. Why wouldn’t it if we let them get away with it ? I may be mistaken but isn’t this an obvious instance of fraud ? I seem to recall that fraud is obtaining money or reward under false pretences. Je peux me tromper mais il me semble que cet example-ci, c’est la fraude ? Je rapelle que la fraude est d’obtenir du fric ou des prestations sous de faux prétextes. I agree, this is racket. I am a RBKC resident and I refuse to pay to park my bike and use bays that have not got any additional benefits compared with others. Their ground anchors are worse than useless and the permit-only bays are constantly empty. Can’t the council understand that their permit-only bays are not wanted? I also work in the RBKC and my colleagues keep having trouble every day to park their bike due to the continued lack of spaces for visitors, it’s a bloody nightmare. It’s really annoying to see lots empty permit-only bays and lots of over-crowded visitor bays. I have addressed the issue to the council many times and they have either failed to reply or told me that they’re looking into the issue, but they’ve been looking into it for more than 2 years…! These councillors are worse than useless. I know who I’m not going to vote for at the elections next week. I am actually very angry about this.